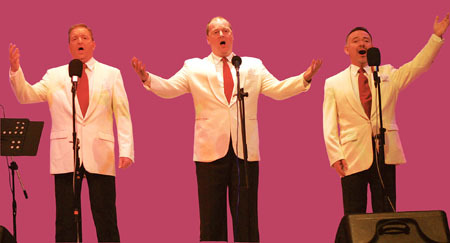 The Three Tenors - Le Voci return to Ballinasloe Carlton Hotel on Saturday April 4 to promote their new album Il Mondo. Their unique show with their own brand of humour, features the world’s most beautiful songs from Elvis (Love Me Tender ), Sinatra (My Way ), Bocelli (Time to Say Goodbye ), Pavarotti (Nessun Dorma ), and a great Lloyd Webber selection. Joined by a superb star soprano and stunning violinist, The Three Tenors - Le Voci will delight and thrill you all. Now established for well over five years as the leading show that consistently achieves full houses in Dublin’s Helix, Cork’s Opera House, Belfast’s Waterfront, The Three Tenors –Le Voci continues to be a major attraction at all venues and festivals all over Ireland and abroad. Make no mistake, this is the only established tenors show that consistently tours and sells-out in Ireland and the only genuine Irish tenors show to perform annually at Belfast’s Waterfront Hall, the largest state of the art auditorium in Ireland. With their new hit record Il Mondo just out and the show a major success at all venues nationwide, this is the star show you must not miss.